With all that watermelon I've been consuming this summer in mango watermelon lemonade and salads, I had to find some other great ways to eat our fruit. 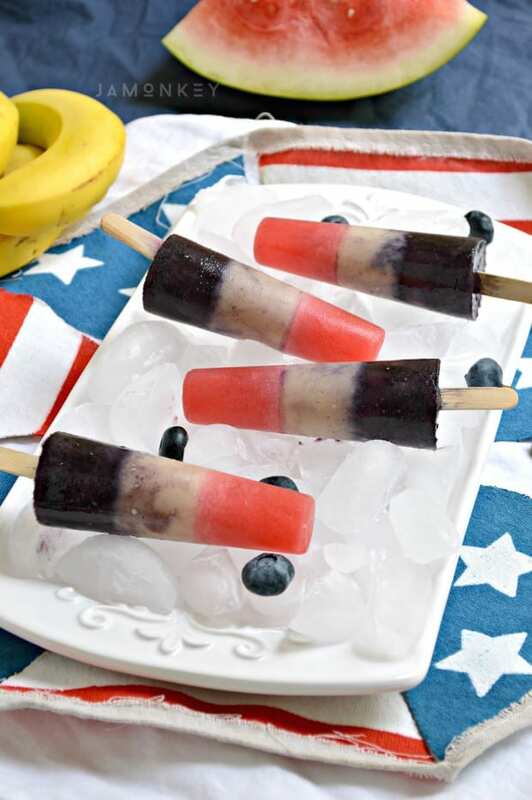 These patriotic ice pops are made from all natural healthy ingredients and your kids are sure to love them. Make some for the 4th of July or Memorial day to show your love for the Red, White, and Blue! 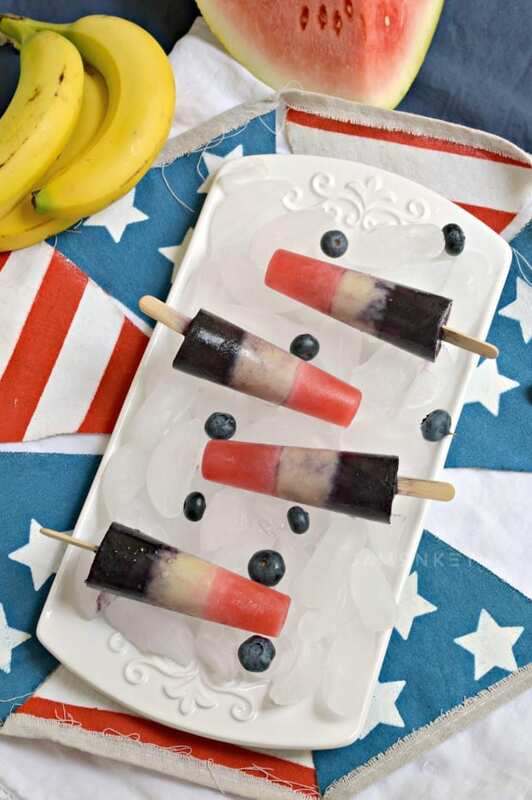 Here is what you will need to make these yummy fruit pops. Simple Syrup is just a handle liquid sweetener that you can make and store at home for things like drinks and snacks. I prefer the natural sweetness from the fruit but if you find that your fruit hasn't hit the ripe sweetness, you can add in some simple syrup to substitute. To make Simple Syrup, you just heat 1 part water to 1 part sugar in a sauce pan until the sugar has dissolved. Cool the syrup and store in the fridge for a couple of weeks. First make the watermelon layer. Allow that to freeze for 40 minutes. Then add the banana layer. If the banana smoothie is thick this is when you can insert the stick. Allow it to freeze for another 40 mins. Last, add the blueberry layer and throw in 1 blueberry inside. Freeze again and then enjoy! We will be making these this year. Those look yummy!